Add Even More Magic to The Holidays with Crayola! We have always been HUGE Crayola fans and I mean huge. I grew up with an intense love of creating art and I have passed that down to both my children. You see, we are very creative people and love to express ourselves through various forms of art and Crayola has always made that more than possible. 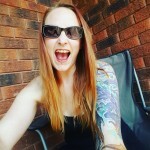 I still love colouring with my daughter or making marker magic with my son. No matter what we are creating with are always creating it with Crayola. This year, we got the chance to create magic with Crayola. No, I haven’t finally lost it. We really got to experience what it was like to create magic with Crayola! Check it out…. I love how easy it is to store the action cards and gel FX Markers. Just put them into the handy dandy compartment at the back of the unit and clean up is made super easy! The stand makes it super easy to show off all your wonderful creation and watch them move as the animation goes. We love the many different action cards. 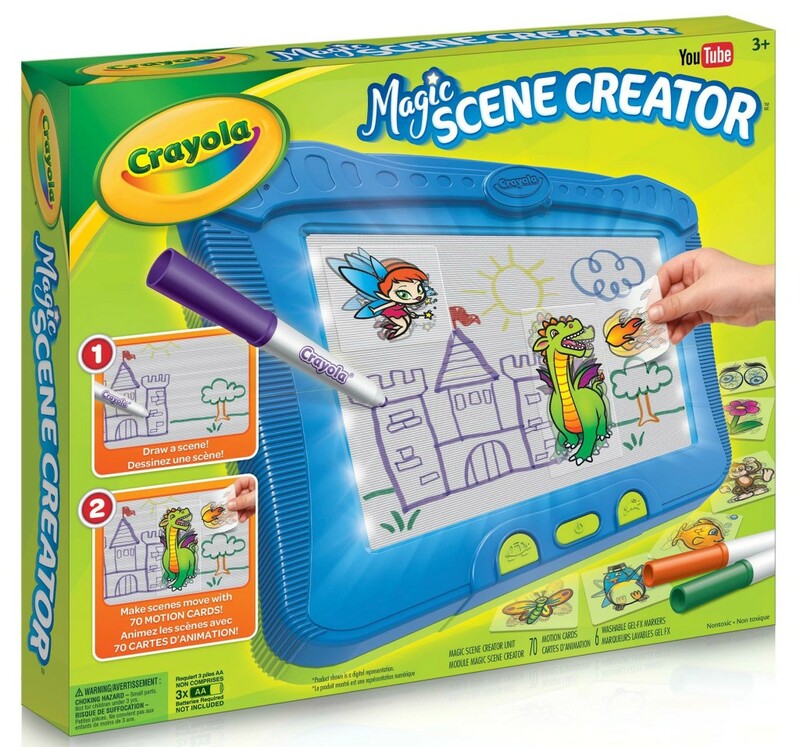 There are so many to choose from, making creating your own Crayola magic a breeze! It’s so much fun to watch your designs come to life with the Crayola Magic Scene Creator. 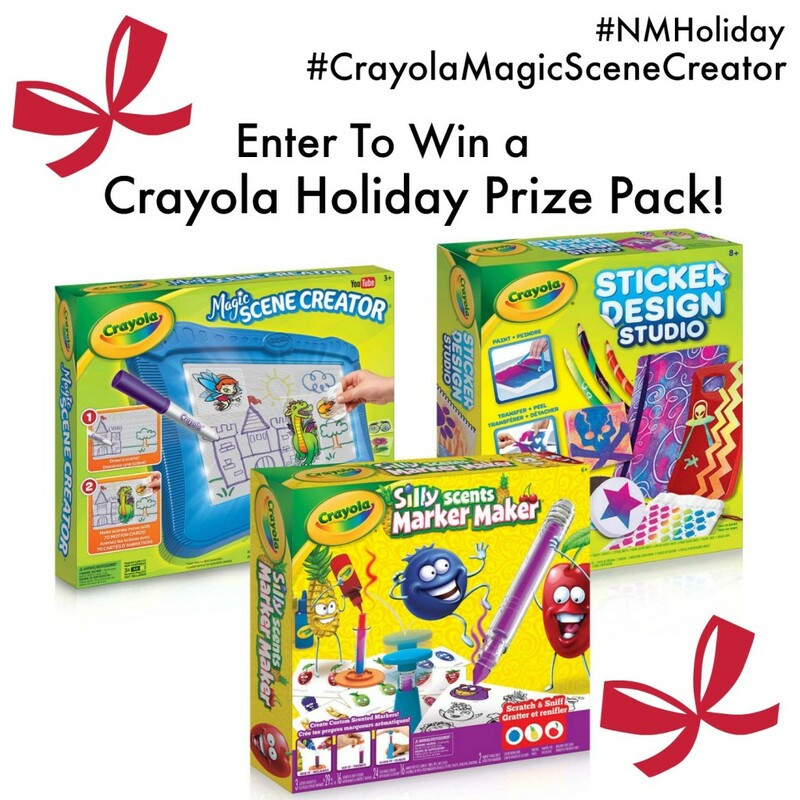 Now you can enter to win an amazing Crayola Holiday Prize Pack of your very own! 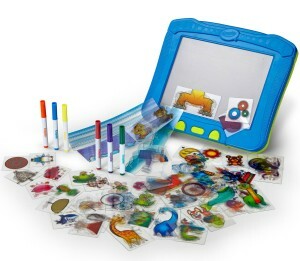 Valued at over $70 and includes The Magic Scene Creator, Silly Scents Marker Maker and the Sticker Design Studio. Giveaway is open to Canada Only (excl. Quebec). Winner will have 48 hours to respond when chosen before a new winner is selected. Good Luck! I know my 8 year old would just love this. Thanks! I think my kiddo would enjoy this. He has a creative side to him that likes to shine every now and then. My niece would love this. She loves doing Arts and crafts. My little Cousins with absolutely love to receive this because they’re a very creative and love doing any kind of art. I would give this to my grandson if I won. I know he would love it. My youngest daughter loves all Crayola products because they help her create all of her arts and crafts stuff. She is always making or designing something. My daughter would. She liked to colour and draw all the time. I would give it to my youngest because she is very creative and loves to draw. This will allow her to see her creations come alive. My grandkids would love these , crayons always have great toys. 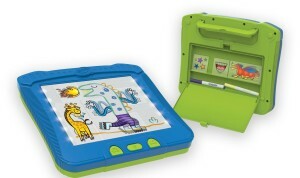 My niece would love these products because she loves to draw, color and create art! I would love to win this for my boys. They love to use their imagination and get creative. My daughter and I both love to create with Crayola products. This would make a great gift for her! My daughter would love these as she is so creative! I have a granddaughter who would enjoy these Crayon a products because she is very creative. Both my son and daughter would love these Crayola products. They both love being creative and using their imaginations and these products allow them to do that. My grand daughter (who is 5) loves to art and creating and she’d be super excited if I won this for her! Oh wow this is so awesome, my granddaughter would be thrilled to receive this, crayola is the best!! My daughter would just love this. Lately she’s been all about drawing and creating.. plus having your creativity come to life right before your very eyes is pretty exciting! I would gift the products to my grandchildren. Crayola products are always fun. Our grandson, Cameron, has shown some wonderful artistic ability. I would love to see what he would create with this. Thanks for the super giveaway opportunity and Merry Christmas. I would love these Crayola products for my daughter who likes to create art. My niece would love these Crayola products. I have two little artists (kids) in my family who love anything they can create with! My guy is quite an artist in the making and he would love these Crayola products. My niece would love these, she is so creative and loves anything crafty. My 2 girls would love these Crayola products. They love to make things and craft most days! My 7 year old would love these because he loves arts and crafts and colouring. My 6 year old granddaughter loves to draw for hours. When it’s warm out, she loves to do chalk drawings and in the cooler months she loves to draw pictures of her family and two cats. love the classic Crayola crayons! great for my friends’ kids! My youngest son would love this because he loves to draw. He loves using a lot of different colours. My niece would love this because she’s so creative and loves to paint and draw. Both my kids love Crayola and I know they’d love this. My niece and daughter would love this. They love to color. This would be a ton of fun for a niece! My niece & nephew are a crafty pair of kids who would get a ton of use out of this Crayola set! They are creative & would really enjoy it.